We now offer a secure & convenient way for you to contribute to your parish! Learn more about Online Giving! Next, create your Login Information. You will need to create a User ID and Password. The User ID must be 6-12 characters and contain both letters and numbers (such as smith78). The password you choose must be 8-16 characters and contain letters, numbers and at least one symbol such as !, @, & or *. You do not enter information for the Registration Code. (That is for account administrators only). Once you click on this link, you will be taken back to the St. Lawrence Parish Online Giving login page. Step 4 is to enter your User ID and Password in the Existing User Login section and continue setting up your account. You will need to enter information the bank account you wish to use for your donations. Once that information is entered, you can then set up donations for the Sunday Collection and the other funds listed on the site. 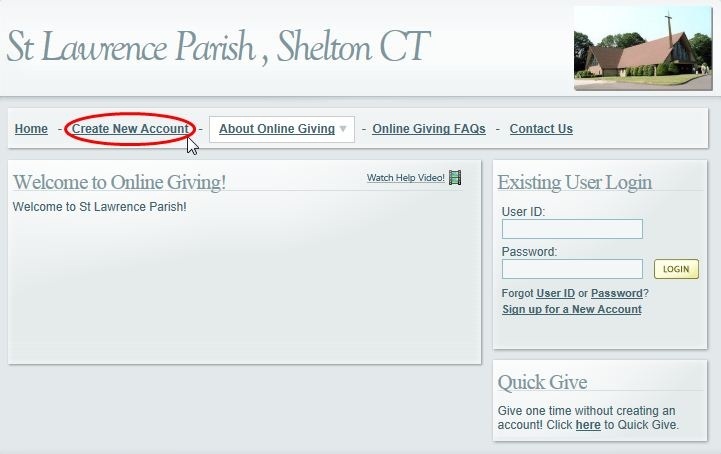 If you have any questions regarding our Online Giving program, please contact the Parish Office at 203-929-5355, ext. 2.